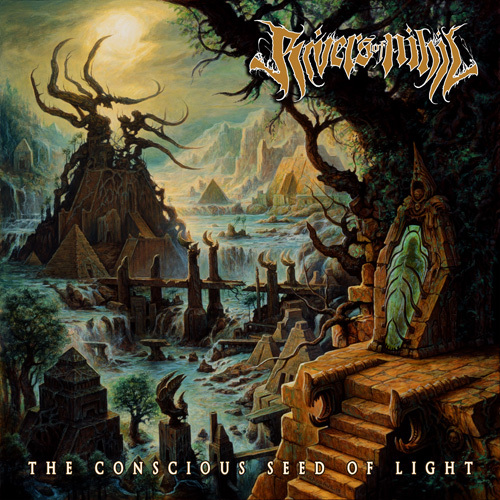 I honestly did not know what to expect from Metal Blade’s Rivers of Nihil’s debut album “The Conscious Seed of Light” as I have never previously heard of them. To my biggest surprise, the album opens up with a violent, moody crescendo instrumental song rather than your run-of-the-mill tech-death intro-less assault present on oh so many death metal records. Indeed, instead of immediately showing off their instrumental prowess and technicality, the boys from Rivers of Nihil opted to show off their many influences and talent as songwriters, something that is consistent throughout the whole album. Granted, if “Rain Eater”, their opening track, is straight up fast, violent and somewhat reminiscent of Decrepit Birth, the following song presents slower, more melodic parts and Gojira-esque, djent-like breakdowns. You heard me folks, hiding behind a death metal exterior these songs juxtapose obvious djent influences while never straying far from a tightly-woven, technical death metal. Unfortunately, after a playthroughs I still cannot easily recall a full song, only certain powerful parts but…no real identity. Rivers of Nihil truly shines in moments where they create anticipation rather than full-on blast-beat driven assaults. A perfect example of their masterful songwriting is present at the two minute mark on “Mechanical Trees” where space-y guitars fusion with technical drums and groovy bass lines to form a truly unique patchwork that entices the listener to bang his head. Far from perfect but perfectly violent and very well written, this album sounds beautifully and is definitely worth a spin. 3.5/5 dragons.